Peaceable Kingdom: NorthStar Pet: Skunk Encounters or The Big Stink! 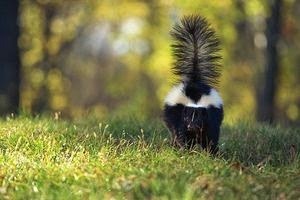 NorthStar Pet: Skunk Encounters or The Big Stink! Have a general knowledge up-front just in case. Quick action will make the difference. If your dog gets sprayed directly in the face, check their eyes and face first; seek medical attention as needed. Talk with your vet now about recommending a recipe for an eye wash solution or a solution you can store to keep within reach. In Central Ohio, we find skunks in both urban and rural environments. Skunks are usually out near dawn and dusk and on full moon nights. You may see them during the day (during skunk love season) in February. A skunk would be happy to just move on by and only sprays as a last resort. It usually uses an audible purr or growl warning, then body language to ward off any danger before raising its tail to spray (a sulfuric oily blend). That aroma permeates the air for hours. Nature's Miracle. Original and Skunk Odor. Nature's Miracle Skunk Odor really works, and works well. I highly recommend picking this up and just having it handy - hopefully you'll never have to use it! You cannot make this recipe ahead of time to store - it must be made as needed. This mixture was developed by chemist Paul Krebaum about 20 years ago. 1 to 2 teaspoons liquid soap (not detergent). For large pets, add one quart of lukewarm tap water for complete coverage. Avoid eyes, nose, ears, mouth, and open wounds. Note: The Skunk Spray has oils (thiols). Dawn brand dish soap has a proven track record for cutting through and neutralizing the effects of oils, and if you want to take a less-chemically-based approach, Method brand dish soap is also effective on breaking up grease and oils. Another note: Remember a dog's natural inclination to shake when wet!! You may need to apply this wash more than once. White vinegar. Dilute it with water or straight from the bottle or mix with baking soda. I've yet to find a gross odor (including when a dog rolls in something dead and decomposing) that white vinegar won't neutralize. Baking soda. I have had success neutralizing skunk odor mixing white vinegar and baking soda (make room - this mixture bubbles up). Set bowls of baking soda around the house to absorb odors. Microfleece wipes/towels. Handy, soft, work great for clean-ups. Household sponges. To ease distributing the neutralizing solution or to help with rinsing. Clothes... you'd feel comfortable tossing after use. Disposable containers (to mix stuff in). What about Tomato Juice? The old adage: Tomato juice/sauce sort of works in real life (it just masks the odor) and always ends up as a nice plot device in books, movies, and tv shows (where they don't actually have to clean up after! ), but who has that much tomato juice around and then you have another mess to clean up. Advice from the Daily Puppy. Advice from Natural Dog Health Remedies.